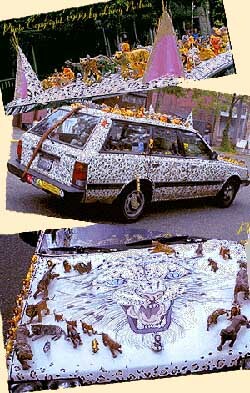 This was my 1989 Subaru DL wagon. We’ve travelled to art car events and parades all over the U.S. My vehicle is quite modest compared to the other spectacular sculptured, glued, welded, transformed autos you’ll see on these links and in my paintings. Bernie is covered with hundreds of big cats — lions, tigers, leopards, and cheetahs. He has welded ears and a tail. 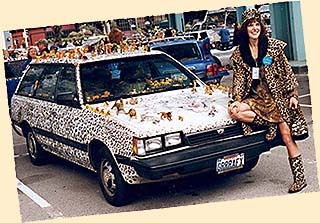 Driving an art car is a definite ice-breaker at cocktail parties and a definite deterrant to road rage.